Sew what's cooking with Joan! 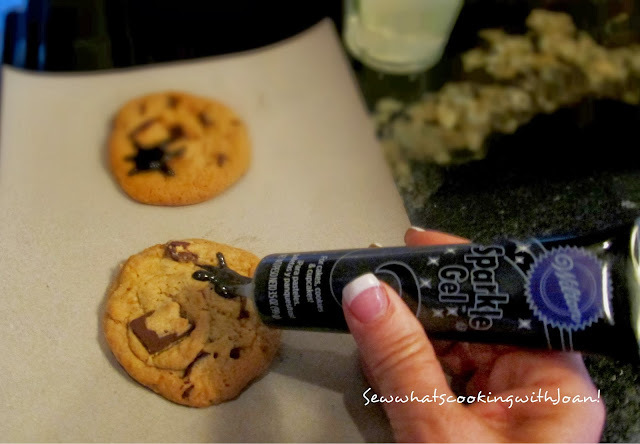 : Fast and Easy Halloween Treats Part 2! Cut a slit in top of each marshmallow; insert a candy. Carefully insert a lollipop stick through the bottom of each marshmallow and into each candy. The lollipop sticks, that not only keep the 2 eyeballs together, but prevents them from flipping over due to the weight of the candy. Without the stick, they would fall forward into the hot cocoa. 1 recipe of Tink's Heavenly Chocolate Chip Cookies or Peanut Butter and Bacon Cookies or Extreme Chocolate Chip Cookies or Pumpkin cookies with Penuche Frosting or if you are really in a pinch for time, buy some cookies at the market. 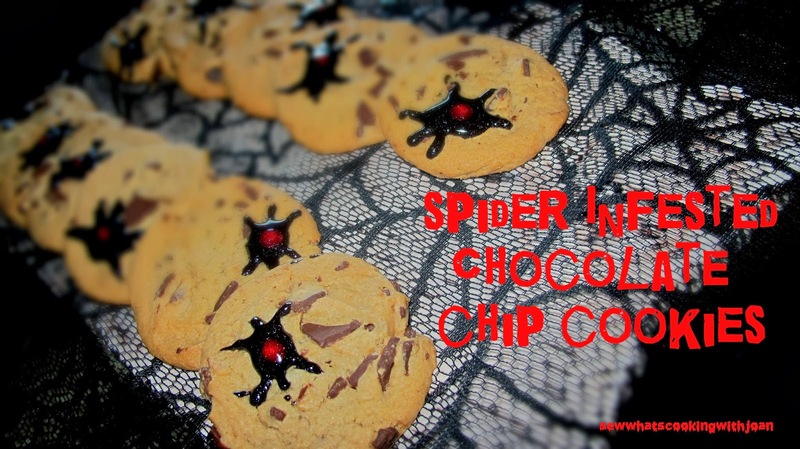 Just make the spiders as if they are crawling on the cookie. 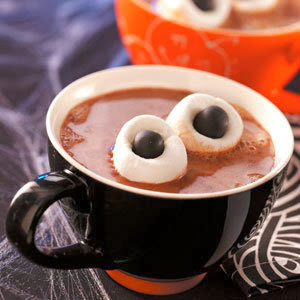 Don't forget to scroll down for "part 1" of "Fast and Easy Halloween Treats"! Finally a drink for my vampire friends! I'm flying back to the Pacific Northwest to be with my Granddaughter, "Little Miss Teapot" on her first Halloween. Beings I'm a vampire, should only take me seconds to get there! I am so excited!! 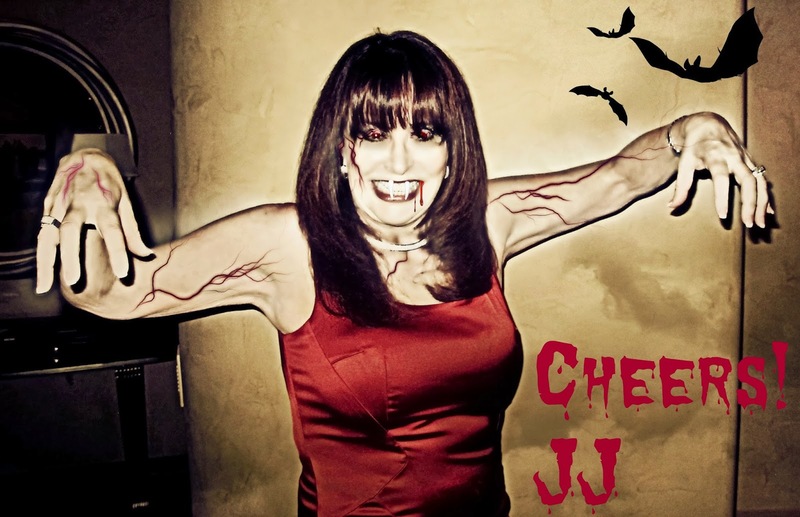 Have a super Halloween! See you on Friday with a yummy Fall soup! Love your costume and make up, you are amazing! One question, where did you find sparkle gel? I am making all the treats tomorrow for a party tomorrow night. Our kids aren't doing the house to house thing. We are having a party and everyone is bringing treats to hand out to each of the kids. Love your blog and all the stories and background behind the various dishes. Keep up the great work!